Why am i mentioning this AGAIN, you ask? Since i do mention this incredible skincare product so often, i wanted to create one post all about it that i can reference in the future. 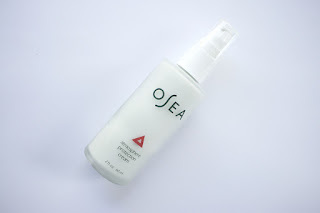 When i first started using Osea's APC, i thought i'd only use it in the winter or extreme climates but... i've been using it solidly for about 6 months now and don't intend on stopping. I apply this every day and night as the last step in my skincare and have found around 4 pumps (they're tiny pumps) is plenty for my whole face. Its instantly absorbed so perfect to apply right before makeup as it leaves no residue but works throughout the day to somehow both hydrate and stop my skin from producing excess oil. As someone who struggles to find balance in my combination skin, this product has made more difference to my skin as a whole than any i've tried. Combination skin is notoriously difficult to deal with because sticking to one product will only treat one area of your face and possibly make the rest worse. This product is different because it successfully balances all aspects. Over time i've noticed my skin has just started to behave better, i have less breakouts; any i do have heal faster; i'm not getting overly greasy because of astringent ingredients... its just absolutely perfect for my skin and gives it everything it needs. "SKIN TYPES: Normal, Dry, Combo, Sensitive. The natural emollient properties of seaweed give this cream a uniquely light and silky texture. Vitamin E strengthens collagen and increases elasticity." I've been trying to figure out how to explain why its been so great to my fickle skin and all i can think of is that it works because it provides mineral hydration. Its not oily, not drying.. its perfectly balancing. Find this amazing product and more here. note: Affiliate links are used in this post. This helps support my site but you are under no obligation to use them!